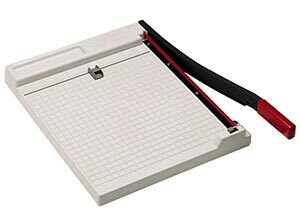 How to cut the business cards using the basic paper trimmer. Set your document layout as follow. Then place rest of the card artwork 2" below the first set of cards. 2. Cutting the vertical side of the cards. First cut 1/2" from the top of the paper. Then cut 1/2" from the left and right of the paper. Now, cut between the two rows. Combine both sets of cards and cut at 3.5"
3. Cutting the horizonal side of the cards. Set the cutter guide to 2" mark. Cut the cards at every 2" to complete the task. Then place rest of the card artwork 2.5" below the first set of cards. You should have left 1/2" at the bottom of the paper. Set the cutter guide to 2.5" mark. Cut the cards at every 2.5" down to the bottom of the paper. Now combine all the cards. Set the cutter guide to 2" mark and cut the cards all at once to have a consistant size.